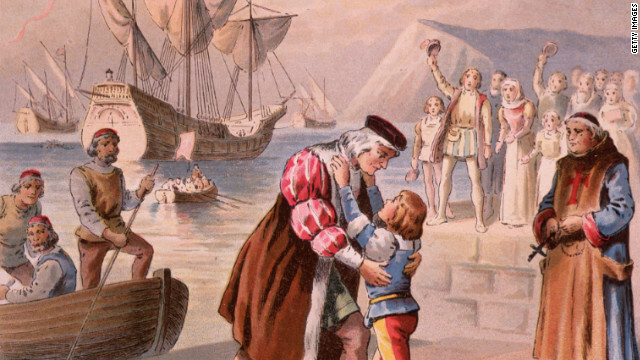 The Coming Depression: Was Columbus secretly a Jew? For too long, scholars have ignored Columbus's grand passion: the quest to liberate Jerusalem from the Muslims. 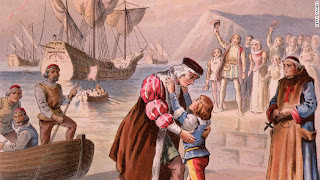 Estelle Irizarry, a linguistics professor at Georgetown University, has analyzed the language and syntax of hundreds of handwritten letters, diaries and documents of Columbus and concluded that the explorer's primary written and spoken language was Castilian Spanish. Irizarry explains that 15th-century Castilian Spanish was the "Yiddish" of Spanish Jewry, known as "Ladino." At the top left-hand corner of all but one of the 13 letters written by Columbus to his son Diego contained the handwritten Hebrew letters bet-hei, meaning b'ezrat Hashem (with God's help). Observant Jews have for centuries customarily added this blessing to their letters. No letters to outsiders bear this mark, and the one letter to Diego in which this was omitted was one meant for King Ferdinand.